Concern for flooding, as at El Capitan Canyon in 2017, below Thomas, Whittier, and Sherpa Fire burn areas has the county calling for an evacuation starting Tuesday at 10 a.m.
[Update: January 15, 2019, 11:30 a.m.] Evacuated areas are closed and road control points in the areas that align with creeks and channels will be limited. Law enforcement will be using roving patrols to enforce the closures. The Santa Barbara County Office of Emergency Management warns the public to avoid using roads in those areas as they could become unsafe during peak periods of rain. Hyatt Santa Barbara, La Quinta Inn & Suites, Residence Inn by Marriott Santa Barbara, Ritz Carlton Bacara, and Upham Hotel are offering discounted evacuee rates, reports Visit Santa Barbara. Visit the tourism agency’s webpage for prices and updated information. [Ultimas Noticias: Enero 15, 2019, 11:30 a.m] Las areas de evacuacion estan cerradas y las calles que estan aliñadas con arroyos y canales seran limitadas. Policia estara usando patrullas para cumplir los cierres. La Oficina de Manejo de Emergencias del Condado de Santa Barbara adverte al publico que evite el area. Las calles podrian volverse inseguras durante periodos de maximo lluvia. Hoteles Hyatt Santa Barbara, La Quinta Inn & Suites, Residence Inn by Marriott Santa Barbara, Ritz Carlton Bacara, y Upham Hotel estan ofreciendo descuento para personas evacuadas. Visite https://santabarbaraca.com/evacuees/. A strong, incoming weather system could produce a debris flow and has persuaded Sheriff Bill Brown to call an evacuation order for Tuesday, January 15, at 10 a.m. for below the Sherpa, Whittier, and Thomas Fire burn areas. The weeks of recent rain have had emergency managers and weather forecasters on their toes, and the system slowly moving our way could deliver from a half inch to a full inch of rain in one hour, with more if thunderstorms develop. 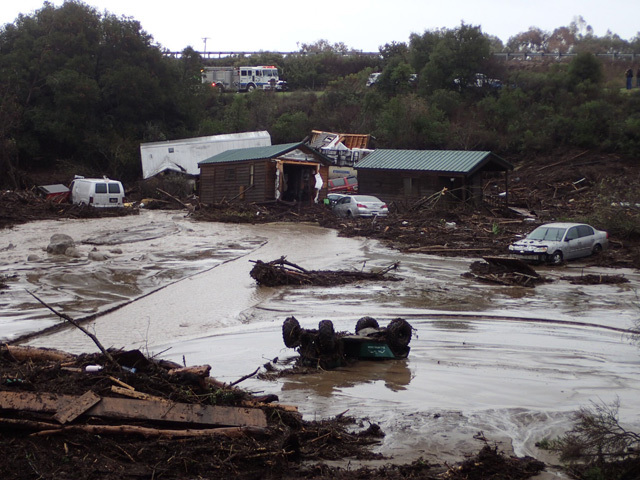 In the second year after Thomas, a debris flow could occur at rainfall of 0.8 inches per hour or above. Click the <a href="https://sbcoem.maps.arcgis.com/apps/webappviewer/index.html?id=9a21092d1754448cbdedadb7bb1ee12e" target="_blank">Winter 2019 Evacuation Map</a> to input your address and find your location in relation to the flood and debris flow zones. Residents are asked to check the Winter 2019 Evacuation Map, which reflects the location of water courses and creeks, and make preparations now if they are in the flood or debris flow zones. Residents without internet service can call 2-1-1 or the emergency call center at (833) 688-5551 for assistance in verifying their location in or out of potential flood areas. From the experience of the January 9, 2018, debris flows, the roads in and out of the flood areas could become inundated and impassable. The county advises residents outside flood zones to consider their proximity to potential flood areas with this in mind. During the 2018 disaster, utilities and sewer lines were disabled as well. A Red Cross shelter is being set up at the Goleta Valley Community Center, 5679 Hollister Avenue. Small pets can be taken to the Humane Society or County Animal Services at 5399 and 5473 Overpass Road, respectively, in Goleta. Large animals can be taken to Earl Warren Showgrounds. El Montecito and Crane schools have closed for the day. The schools at Mount Carmel, Laguna Blanca, and Montecito Union will be at alternate sites. Santa Barbara Unified and Carpinteria Unified will be open. More rain is expected Wednesday evening through Thursday. The City of Santa Barbara has a sandbag station set up at 401 East Yanonali Street. More evacuation preparation information can be found at readysbc.org. Correction: This article was corrected on January 15 to reflect that Tuesday is indeed the 15th, not the 14th.